Oh how I need something to keep me motivated in order to complete existing projects. OMG fits the bill! 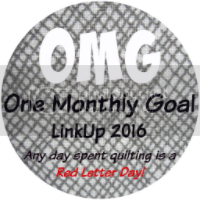 February will be the first month for me to join OMG and commit to finishing a quilting monthly. 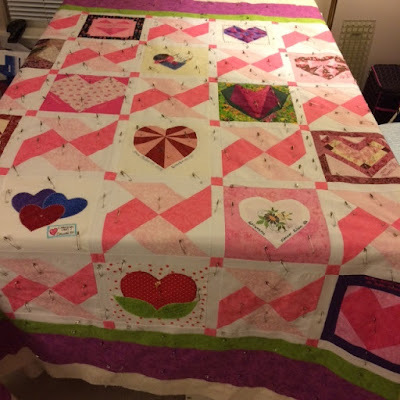 I aim to complete my Heart Swap Quilt. Oh what Fun!, and in February where hearts and Valentine's Day go together. I received the wonderful heart blocks in a group block swap in 2011, and pieced the quilt top in 2012. September 2015 I pieced the backing while at a quilt retreat, and in December 2015 sandwiched the quilt. Also in December, I started the quilt design pattern drawing it on Golden Threads paper. It is a panorama border to border design. Since I ran out of Golden Threads paper the project was held up waiting for the delivery of my order. In the meantime I pieced together my Red Work Winter Twitterings flimsy. The quilt size is 70 inches x 70 inches with 36 blocks and two borders. Wish me well!! If you need a push or shove to get yourself motivated be sure to connect with Red Letter Quilts. Today is the last day to describe your monthly project. Whew! I noticed it on the last day. Luck, luck, luck! I'm sure it will be beautiful when finished. What a fun Valentine! I have a roll but have never tried the Golden Threads paper & look forward to seeing the quilting!